What is CRM and How Can It Benefit Small Businesses? What is a CRM and how can it benefit small businesses? As a Virtual Assistant who helps freelancers and small business work smarter, finding systems and processes that improve organisation is one of my special talents. (The other is making an excellent cup of tea with my eyes closed, but that’s not really relevant right now, is it?). In this quick guide, I’m going to answer the question ‘what is CRM?’ and give you a brief introduction into how you might use a CRM system to benefit your business. CRM, or Customer Relationship Management, is the strategy and process of nurturing client (and prospective client) relationships. Effective CRM can help businesses improve the way they handle leads, sales and ongoing client relationships. A CRM system is the software companies use to make customer relationship management easier. It’s a system that stores data in one central location, making it easier for multiple team members to manage an account. An online CRM system with cloud storage also makes it easier for businesses to access their client data from anywhere, at any time. How can a CRM system benefit small businesses? When it comes to sales, knowledge is power. The more you can track and record your clients’ likes, dislikes, preferences, questions, enquiries and desires, the easier it’ll be for you to meet their needs. As your business grows and you bring on new team members, your CRM system will expand to accommodate more clients and contacts. You can even get bespoke systems that are designed exactly for what you need. Smart CRM systems can help you keep track of your clients’ activities on social media, making it easy for you to understand more about who they are and what they need. Forget business cards or a spreadsheet that can only be accessed from one location. With a cloud-based CRM system, you and your team can get access to your data whenever, from any device. Which is the best CRM system? Email me at sadie@sadiefinch.com to let me know what features you’re looking for. I’d be happy to recommend the ideal system for you. Depending on what your needs are, the price can be anywhere from free up to over £300* per user, per month for an advanced system. The free versions are usually a great place to start if you’re a small business. 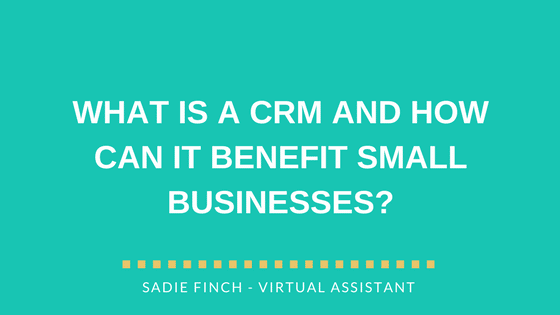 For help setting up a new CRM system, email me today at sadie@sadiefinch.com, or find out more about my CRM set-up and support service.